Can you believe that I just discovered Instagram? I had no idea there was a whole other community of nail polish addicts on there, but I should have realized that, it being a picture based app. Duh. So anyway, I signed up and posted a few pics. If you have it(which you probably do since I'm way behind in technology these days), please follow me there @prettytoughnail. Once I get the hang of it, I'm sure I'll be posting more! And please message me there if you have an account, I'd love to follow you too! 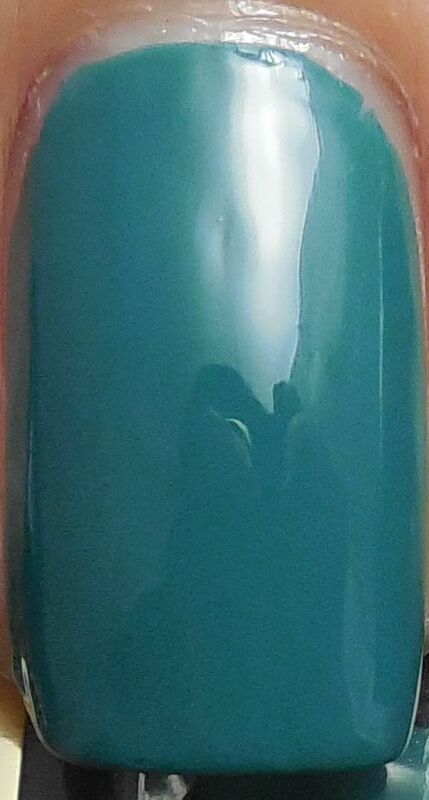 I had no idea what to expect from the color since I hadn't seen any swatches of it yet, but once it arrived, it certainly can be considered a green shade but it's not as jade looking as I thought it would be. It's more of a teal green cream, think China Glaze Exotic Encounters green. With the wide brush I used two highly pigmented coats for this mani, and I found the formula to be a tiny bit too thick so self leveling properties weren't quite there unlike the other YSLs I've tried. I imagine a drop or two of thinner would straighten that right out. It dried shiny on its own but I finished with a layer of Poshe to smooth it out. After a day of rough wear at work, it held up pretty good all things considered. Only one chip and that's after lifting big boxes, opening bottles, typing, and shuffling paper. Most manis are wrecked after a day of my kind of work. So the big question is, is it worth it? For me, as a collector and lover of all things YSL, yes it is. If you like the shade and don't care about the brand, then I think perhaps China Glaze would be a better option. I ordered Illamasqua Venous today, so once I get that, I'll do a comparison of all three and see how close the shades are. Do you suffer from my affliction of ordering the same color in different brands? Thanks for you nice review and good pictures!I will be interested in seeing the dupes. Would you please elaborate why you see the word "Orient" as unappropriate/ politically uncorrect? Gosh it's a very antique word and full of meanings, along with its sister opposite word, "Occidente". Looks like someone would like to sanitise the whole world culture step by step. Maybe worth mentioning to those who take brave decisions on what's correct and what's not. As far as I'm concerned, I think it's best to avoid the use of the word altogether just to avoid stepping on anyone's toes. The only time Orient/Oriental should be used IMO is when describing a rug. I avoid using the world Latino/Hispanic for the same reason. I never know which is correct to say in a situation unless I know for certain the person is from Latin America or Spain. Thanks for the good question, and I should be able to get those swatches up this week. Take care!